General Manager Luella Penniall with a selection of Anzac biscuits in special tins and packets baked at Kaye’s Bakery. A family-run Southland bakery which usually flies under the radar landed a special contract. Kaye’s Bakery of Invercargill secured the contract starting 2015 to produce Anzac biscuits for limited edition World War I commemorative Anzac biscuit tins. 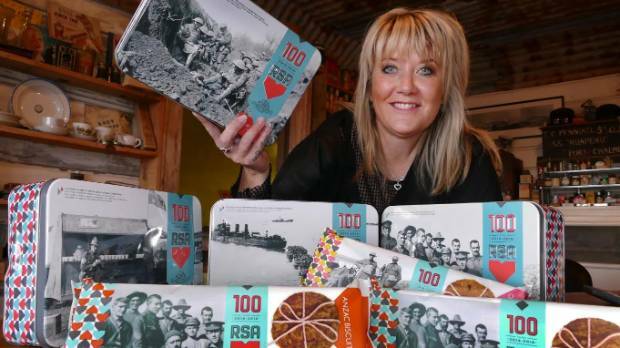 Kaye’s Bakery General Manager Luella Penniall said the tins were the result of a partnership between the Returned Services Association and Blenheim company Action Food Marketing. The tins were available in seven limited edition designs, featuring embossed photographic scenes of New Zealanders during World War I. It was great a Southland business was involved in the project, Penniall said. Action Food Marketing had told her the tin designs and biscuits had been a hit, she said. Kaye’s Bakery owner Evan Penniall said the commemorative project had created significant business for their company. Initially the company became involved in the project through the RSA but later passed it on because of the marketing requirements. However the company became involved again when contracted by Action Food Marketing to do the baking, he said. The company had produced millions of biscuits to fill the order of 54,000 tins. There was just so much to think about, she said. The family credits their hands on experience for their success.